Did you watch the VMAs last month? 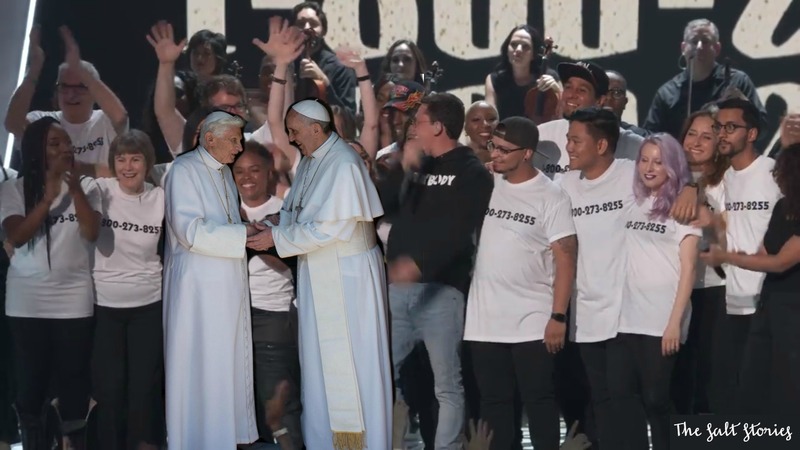 I bet you didn’t know that Pope Emeritus Benedict XVI was in attendance at this year’s MTV awards’ show. Well maybe that’s a stretch, he was not physically in attendance, but one of his lessons made an appearance. Hang in there with me, I will explain. Every time the song opens and I hear Vision say, “I don’t wanna be alive,” my skin shudders. It is hard to get through the first verse. It feels as though you are traveling in another person’s darkest mile. This song shares an honest experience about recognizing both yours and others’ value and necessity in this world. What a breath of fresh air. It was a performance and song created not to make the self more important, but to make the listener more aware of their own importance. The performance felt like a 2017 hip hop resurrection of this quote by Pope Benedict XVI. They both desire the listener to realize they have inherent value in their life and to grow in the reverence with which they see their own life and the lives of others. We are each unique and in the mind of God. From this innate value and purpose flows all of our rights. No matter our status, demographics, or life decisions, we are called to live; our life adds value to this world. I repeat Logic and Pope Benedict XVI’s sentiments. If you are feeling low, like your life doesn’t matter, and like nobody cares, please know I do. You are valuable, purposed, and needed in this world. There is hope and people who want to help. I want you to be alive. 1-800-273-8255. What a video! Hadn’t seen it. Same message of love from two people who are very different, but equally loved by God. Thanks for this post, Amy. Very powerful message! My hope now is that my words can turn in to actions and I am able to be a friend that listens and responds well.